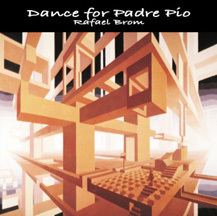 "The Celebration of Padre Pio"
"Padre Pio's Way of the Cross"
"The Canonization of Padre Pio"
"A Celebration of Padre Pio - Pray, Hope and Don't Worry"
by some who have been touched by Padre Pio's miraculous insights. gentle priest who may become become a saint in our time. Pope John Paul II recently visited the historic monastery where Padre Pio lived and died. This was the third time he had come to the remote village in southern Italy, San Giovanni Rotondo. one day, become Pope and that he would be covered in his own blood. Both prophecies have come to pass! On his second visit, John Paul II was Cardinal of Krakov, in his native Poland. But on his third visit he came as Christ's Vicar on earth to celebrate The Holy Mass. It was 25 May 1987, the 100th anniversary of Padre Pio's birth. One of the greatest stories ever told. As recently as 1968 Padre Pio died in a Franciscan Monastery in Southern Italy. alive to be cured of their bodily and spiritual ills. Even more visit his tomb today. Why? (As seen on EWTN of Mother Angelica). Padre Pio said, "After the sacrifice of the Mass, the Way of the Cross is the most powerful prayer of petition. "Father Alessio invites you to come to San Giovanni and follow the Way of the Cross in the footsteps of Padre Pio. in the "city on the mountain" prophesied by Padre Pio. PADRE PIO'S WAY OF THE CROSS was directed by award-winning English filmmaker, J. Paddy Nolan. in Rome with POPE JOHN PAUL II of the stigmatic friar from San Giovanni, PADRE PIO. hear, and see, the Pope declare him to be a saint of the church. monastery, and even taking a ride in a car! in gratitude for his recovery. people whose lives were completely changed by attending his Mass. 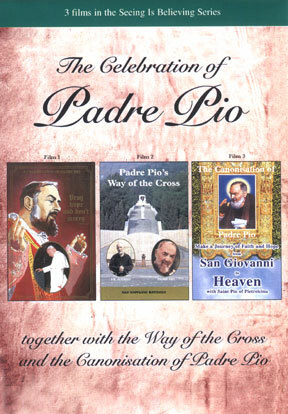 For followers of Padre Pio this is the definitive story of his life, death, and Canonization. St. Pio Pray for us.